What we’re talking about today is that we want to be very generous with God and someone else is interfering. Deep in the human heart, we have a desire to give more and love superabundantly. And God is always calling forth this desire and asking us to share His love with the world. All of us are growing, and we yearn to love more and serve more. But it’s difficult when someone who should support us comes along and doesn’t: They either don’t support us or wear us down with negative comments. But why doesn’t Jesus come down from the cross? He has the power to, but He chooses not to. It’s because He wants to prove to us how much He loves us, that He’s willing to give everything. God could have found another way to save us. He could have saved us by the tiniest cut, because the least sacrifice of the infinite God is enough to redeem us. But He chose the most generous and radical symbol of love: total vulnerability (nakedness), total self-emptying (being nailed on a cross). Question: How did Jesus die? Yes, on a cross, but what was the cause of death? Crucifixion normally kills people by suffocating them. (I’m sorry to be a bit graphic but this is important to understand what Jesus went through for us.) They have difficulty breathing because their arms are stretched out and they can’t get a good breath. Every time they try to breathe they stand up. But because they’re standing on a nail through their feet, it hurts and so they have to take the pressure off their feet and so they hang by their wrists. But then that hurts their wrists, so they switch back to their feet. This keeps on going, often for days, until they completely lose strength and can’t breathe anymore. Jesus felt this, but we know that He died after only three hours, not days. It says in St. Mark’s Gospel that Pilate was surprised that Jesus died so quickly (15:42-44). So, likely something accelerated death. Fr. Francis Peffley, studying the evidence of the Shroud of Turin, says that Jesus died from blood loss, giving up almost all blood (The Passion of Christ in Light of the Holy Shroud of Turin, Track 14, 0:37). We do know that Jesus was scourged and that He couldn’t even carry His own cross, but had to be helped by St. Simon of Cyrene (Mt 27:32). It’s interesting that, in the Old Testament, when the Jewish people sacrificed animals, they would not drink the blood (Deut 12:23), because the life is in the blood; to drink animal blood would be to participate in the animal nature (The Ignatius Catholic Study Bible, 174). It’s likely then that, when they sacrificed the Passover Lamb, they would drain all the blood. In the same way, Jesus, the true Passover Lamb, would give all the blood because the life is in the blood. 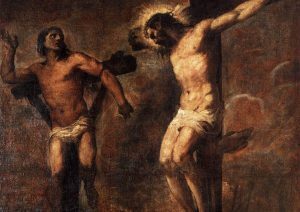 Peter Kreeft asks why Jesus gives 10 pints of blood? It’s because it’s all He had to give (Cf. Peter Kreeft, Defending Marriage in a Post-Christian Culture, Track 4, 3:11). This is how much God loves you and me. He wanted to show us how rich in mercy He is, how He hasn’t left anything in reserve, how He loves us infinitely, and how He’ll forgive every sin, no matter how bad. Every human person, because we’re made in God’s image, is called to love like this. We may not be called to die like this, but to love without reserve and to give ourselves to God. That’s why there are some young men and women, who, when they encounter Jesus and His love for them, respond by wanting to be a priest or sister and give up marriage and family for something greater. Could they become a saint by getting married? Of course. But God’s put it on their heart to get married to Him, to be a sign of total dedication. They want something more: to be like St. 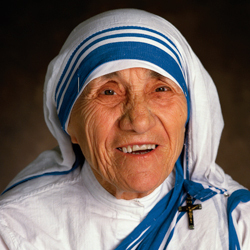 Mother Teresa who served the poorest of the poor, possessing only two pieces of clothing; to be like St. John Paul II, who spoke the truth and fought against moral evil; to be like St. Damien of Molokai, who left Belgium and went to Hawaii to serve outcast lepers and ultimately to die for them; to be like St. Therese of Lisieux, who did so much good in her convent by prayer and sacrifice. William Massey was the youngest person ever to have an exhibit of his own artwork at the Vancouver Art Gallery, at age 16. He was so good that he dropped out of high school early to pursue art. But, when he was 18, he followed God’s call to be a priest and monk at Westminster Abbey. Many of his teachers said he was “throwing [his] life away” (Daphne Sleigh, The Artist in the Cloister: The Life and Works of Father Dunstan Massey, 61). No, he felt a higher calling. When he arrived at the abbey, he told Fr. 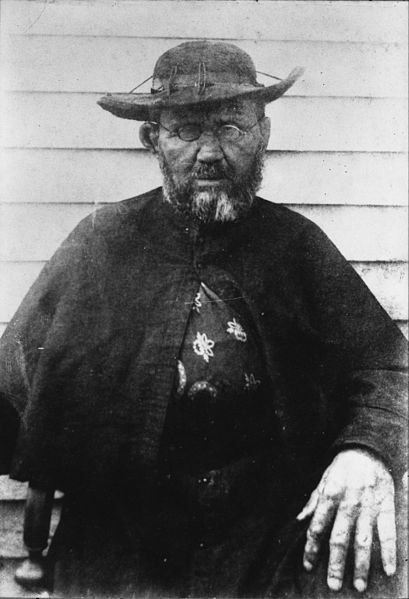 Abbot Eugene that he would give up his art, but Fr. Abbot said that he would use his artistic talent to serve God. I’m sure someone said he could have used his talent to praise God as an artist, but his first calling was to serve as a priest. I know, for example, Chinese culture always wants us to have grandchildren and the boys have to carry on the family name. My own Chinese grandmother wouldn’t get off my case to get married and then have children who would become priests! Then there’s the popular ‘deacon’ option. Instead of becoming a priest, you can get married and then become a deacon and serve God that way. But, if we’re called to be a priest, to choose less is to compromise. Whenever young men discerning the priesthood mention the diaconate, it’s best for them to discern between priesthood and marriage first. The diaconate can be discerned later, only after marriage. All of the young men in the seminary could all leave right now, get married and become deacons later. But none of them want to. They feel a call to be celibate spiritual fathers; even though they love marriage, they want to follow Jesus radically. This is why some families feel called by God to have another child. They want to be generous and love life! 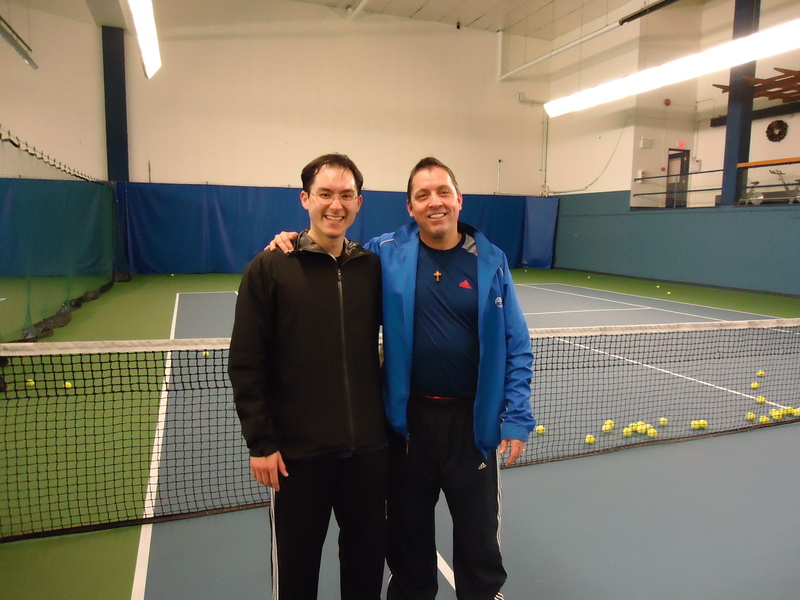 I told you once about Pat Macken, the tennis coach at the Arbutus Club, who used to be ranked in the top 3 in Open Tennis for Canada. When he and I and my friend were having lunch one time after a game, it came out that Pat and Caroline, his wife, have six children. My friend said, “Wow.” And Pat said, “Well, we love children.” Isn’t that a great answer? I met Tyler and Shannon Davis about ten years ago. When I went over to their house and found out they had five children, I said, “That’s great! What made you be open to having five?” Tyler told me that, even before he became Catholic, he wanted to have a big family. When he was working at the Harrison Hot Springs Resort he always helped out with 50th wedding anniversaries, and he said all of the couples, when they were at that stage of life, said, “We should have had more children.” So that made him realize that children are a blessing and, when he met Shannon, they knew they wanted to have a big family. God doesn’t call all of us to have six children, but He does call us to love children, welcome all of them, be generous, and to respect sexuality and not contracept. After that, it’s up to each family to figure out how many children God is calling them to have. Let’s listen first of all to God’s voice. Don’t listen to the voice of compromise or lukewarmness. If we’re generous with God, it will always lead to blessings. If we feel a call to the priesthood or sisterhood, we must follow that, even if our parents don’t understand. The Catechism says, following Jesus’ teaching, that our first vocation is to follow Him (2232). We must love our parents and help them understand. At first my father, being Chinese and not knowing Jesus, didn’t want me to be a priest, because he didn’t understand how I could be happy without a family. He wanted what was best for me. But, to his credit, he loved me enough to let me go follow God. 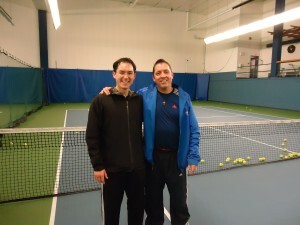 What eventually gave him peace was when I was in my sixth year of studies and I said, “Dad, I’m really happy.” And, at my ordination, when he saw how happy I was and how many people loved me, he was finally peaceful, knowing that his son was happy. Parents, always be neutral when it comes to your kids’ vocations. Encourage them to be a saint and follow God’s call, but don’t tell them one way or another what they should do. As Ricardo Chaparro, a parishioner here, said, “When my kids grow up, they’ll be totally free to choose whatever monastery they want to join.” But seriously, don’t influence or drop hints one way or another. When they feel pressure, they will resist. Today is a celebration of generosity. Jesus is infinitely generous to us and gives everything to us. Since we’re made in His image, we’re designed to love like this too. Love gives generously. ← To Overcome Sin, Go to Confession More!